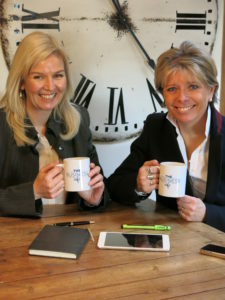 Two dynamic women – Penny Power OBE and Gail Thomas – have joined forces to launch a revolutionary High Street chain called – The Business Café. Penny founded Ecademy in 1998, which was the precursor to LinkedIn, after a five year break from work to have 3 children. Penny sold Ecademy and along with its 650,000 micro-businesses in 2012. The Business Café will launch its first bricks and mortar premise in Peterborough, the hometown of co-founder and social entrepreneur Gail Thomas after completing its first investment round. A crowd-fund on Crowdcube is scheduled for launch on 13th November 2017. 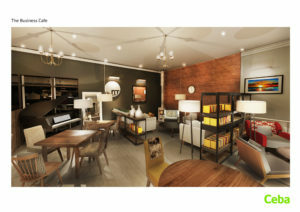 It will then set out on a nationwide rollout with a network of cafes across the country that require a free membership to enter a private lounge-style environment. The Business Café has already built a significant presence online with a number social media communities forming. The aim of The Business Café is to create a fertile environment for small business owners, which make up 95% of Britain’s business community, with the same ‘home away from home’ vibe of Starbucks, but with a more business lounge experience that gets a lot more ‘down to business’. “Small business owners, particularly in regional centres across Britain, will often meet in the likes of Starbucks or a Costa, but always inevitably feel a little out of place having business meetings. The Business Café picks up where Starbucks leaves off”, says Gail Thomas, co-founder and COO of The Business Cafe. Coffee and food will be served at The Business Café with a tie-up with a leading independent retail caterer. Workspace and tables will allow for business meetings. Penny is thrilled with the support The Business Café is receiving from the SaaS market, with 10 key partners now in place to support the Digital Skills program. These are household names that impact the productivity and marketing of small businesses in the UK with their business applications in Book Keeping, Expense Management, CRM, Banking and Digital Marketing. Their involvement indicates the deep rooted belief in the UKs small business sector as well as their empathy with the hard work, resilience, loneliness and their constant need for digital skills and mental strength. The ‘StrongMind-StrongBusiness’ Mental Strength programme for small business owners will also be a key focus of The Business Café, and embraced as it’s number one modus operandi. But most importantly, “The Business Café is a place to make and meet friends. According to Penny, “the digital world, for all its benefits, can’t complete the circuit board in terms of real-time physical social experiences. You really do need both”. “This is what The Business Café is all about, having a place where business owners can network, share problems and help each other over a coffee” she says. Penny and Gail first met each other in 2011 when Gail hired one of the young apprentices for her Virtual PA Company from Penny’s Digital Youth Academy launched in the House of Lords. Penny previously wrote the government’s ‘Manifesto For Digital Business Britain’. They found working together enriching. Penny is very much into networking, marketing and digital skills while Gail has an aptitude for financial management and operations. “We beautifully harmonise both left and right sides of the brain,” says Penny. The government is particularly encouraging about The Business Café’s emphasis on boosting regional productivity amongst small business owners. The increase in sole traders and small businesses over the past 10 years curiously sits alongside the decrease in the nation’s productivity, the hourly output of our workforce. While small businesses work long hours, commit tirelessly to their clients and the sector they work within, we want to track the productivity of this sector and help them to achieve more through digital capability.